Can China's Legal System Change? 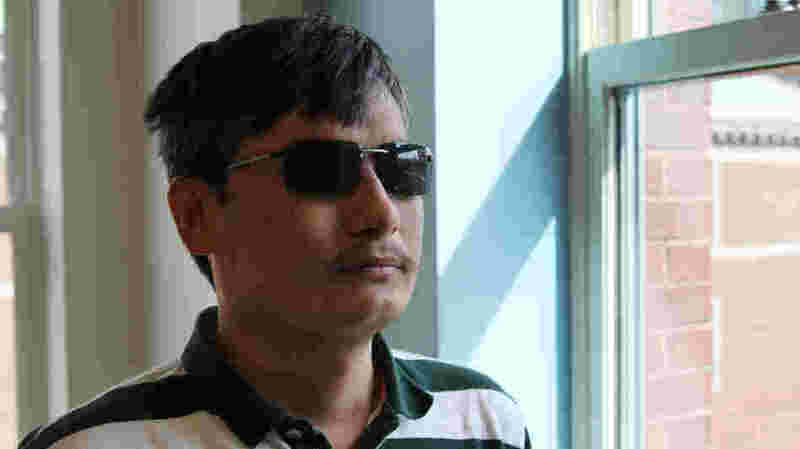 Chen Guangcheng, a blind Chinese lawyer, made international headlines when he escaped house arrest in April. Now at New York University, he believes changes to China's legal system are inevitable. China's Communist Party will introduce a new slate of leaders this month to run the world's most populous country for at least the next five years. Their to-do list will include dealing with the nation's opaque and politicized court system. "China's judicial system urgently needs to be reformed, improved and developed," a government planning paper acknowledged last month. Few Chinese know this better than Chen Guangcheng, the self-taught, blind lawyer who made a stunning escape from government custody last spring. After his release from China, Chen settled in New York, where NPR spoke with him at length about China's rule of law â" or lack thereof. Chen, who is studying law at New York University, is fiercely critical of China's legal system, but also surprisingly optimistic about the potential for change. The rule of law in China is crucial to addressing many of China's most pressing problems and keeping peace in a sprawling, fractious country. The lack of an independent judiciary allows officials often to operate with impunity: detaining citizens without charge, approving environmentally dangerous projects and stealing public money with both hands. Perhaps the judiciary's greatest problem is that it is ultimately controlled by the Communist Party. Chen says the party refuses to give up that power because it is so politically useful. "It's very much against their interests," says Chen, speaking in a conference room at the New York University School of Law in Manhattan. "The implementation of a law would rule out the possibility of foul play on their part." Chen's personal story is a case study in how the party uses the law for political ends. Chen got his start as a lawyer advocating for the rights of disabled people, like himself. In 2005, he took on one of the country's most politically sensitive issues: the one-child population policy. Chen learned officials in east China's Shandong Province were forcing women to undergo sterilization or abortions. "Women were forcefully dragged out of their quilts and taken away by hired thugs," Chen recalls. "They were not even allowed to put on clothes." Li Qun, the mayor of Linyi, a city in Shandong, led a crackdown in which an estimated 130,000 people were beaten and held hostage to force their friends and loved ones to submit to abortions or sterilization. Forced abortion and sterilization is illegal under Chinese law, so people asked local police to stop it. They did nothing, so Chen decided to sue. The central government evaluates local officials on how well they meet population targets, regardless of how they do it. So, the local justice system didn't punish those officials, it punished Chen. He was sentenced to more than four years for destroying property and organizing a mob to disrupt traffic â" charges widely seen as trumped up. Li, the mayor who lead the forced abortion campaign, fared much better. "Well, he got promoted," Chen says dryly. Li is now the Communist Party secretary of Qingdao, a city of more than 7 million on the Yellow Sea. Why did the government reward him with a better job? "It's because he was bad enough," Chen says. The upside-down aspects of the Chinese justice system continue to take a toll on Chen's family. The day after he escaped from house arrest in April, 20 of Chen's former guards stormed the home of his nephew, Chen Kegui, and took revenge. Chen Kegui said the guards did not wear uniforms and did not show a search warrant. When they tried to apprehend him, Chen Kegui said he grabbed a kitchen knife in defense. His mother said the men attacked with one saying, "Beat him to death." Chen Kegui slashed at the men with a knife. He's been in custody largely since then and is expected to face indictment for "intentional infliction of injury." "If Chen Kegui didn't fight back, he would probably have been killed," says Chen Guangcheng. Under Chinese law, as written, resistance would be viewed as self-defense, he said. "But the reality is if they beat you up, it isn't against the law, even it happens in your home. If you fight back, you are guilty." If all this seems as if it would make Chen despondent over China's legal system, it doesn't. China has an extensive code of laws and Chinese lawyers continue to press for reform. Chinese people â" everyone from farmers to factory workers â" are increasingly sophisticated and aware of their legal rights. Chen says eventually Chinese people will demand rights from their leaders and the party will have little choice but to change. "Even China's current leaders know very well that steps toward rule of law and the historical trend that societies move toward constitutionalism, rule of law, democracy and freedom, are inevitable," says Chen. "No power can stop that."